Earlier this week we got a HUGE box of fabric that was given to us for charity quilts. We were so excited that we have more goodies to work with and in turn can help more people. 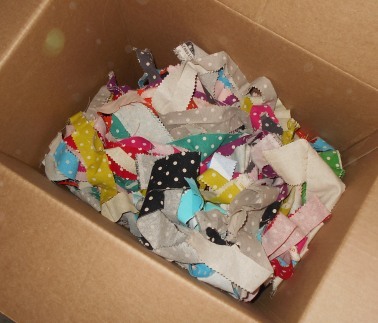 The box was filled with polka dot fabric and the fabric is a linen. I am a bit of a purist and didn’t want to mix the fabric with cotton as I want to make sure they’d wash up the same. Have you made a quilt race quilt before?? What you do is sew the strips together end to end. Then you bring the long snake ends together, cut it in half and sew them together. Keep cutting in half and sewing together. If you haven’t made one before or want directions, here is a YouTube video that shows you how. I thought the idea was wonderful so I started cutting strips. The only problem…some strips were 2″ – some 2 1/2″ and some 3 1/2″. So my question…how many strips did we need to make a charity quilt??? Well, Kayla is a math and computer whiz so she came up with a tool to calculate how many strips and it’s the neatest thing ever!! Simply type in the information and it will let you know how many strips you need to cut to make the quilt size you want. She is so ingenious that she embedded the calculator into this post and made it available for everyone to use. Try it. We put in the information to make a 60 x 80 quilt using 3 1/2″ strips….It says we need 42.666 strips total to make it. Just round up and cut 43 strips. 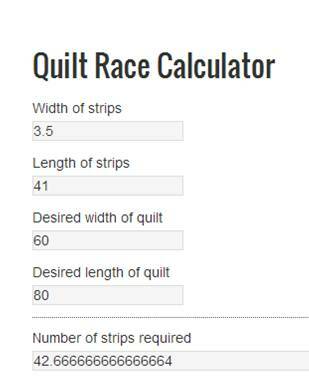 We did end up with one problem though...this calculator will tell you how many strips BUT you can’t sew them like you would a jelly roll race quilt. If you keep sewing in half, in half and in half, you’ll get an awkward size. Here is our suggestion. Sew the strips together making a long-long snake. Then cut 18″ off one end. Cut that long snake in half and sew the two pieces together. Now cut the strips the width you want the quilt to finish at…then sew those strips together. Feel free to stop back and use the calculator anytime. We are putting a link in tutorial section on the right hand column of the blog…just look for Quilt Strip Calculator. With the calculator to do the math, it was easy to quickly bundle up enough strips to make a 60″ x 80″ quilt race kit thanks to Kayla’s math and computer skills. This entry was posted in Quilting on December 11, 2013 by Jo. Super fantastic!!!! Thank you for sharing!!! Thanks so much for the calculator. It is great. Now to use up all those cut strips. Great Tool. Thank you for sharing. Thanks for sharing this great tool!! Thank you so much from another math challenged quilter! Very nice and helpful. Should look into making this an APP and selling it or packaging it with other sewing APPs. What process would you follow to sew them? If you sew the strips end-to-end then in half like the original project you are limited to certain dimensions, correct? Using your figures and the original method, I think you end up with a quilt that is 55″x112″. I ran into this problem when trying to convert the directions to make a queen-sized quilt from a jelly roll. Or have you come up with alternatives for sewing them together? I would LOVE to know how! thanks for sharing. this will come in handy. Oh my goodness, you wouldn’t believe the convolluted way that I figured out what I needed a couple years ago for a race quilt that I made. thank you so much. followed your link from Bonnie Hunter’s Celtic Solstice page. Your daughter is BRILLIANT!!!! Thanks for so generously sharing it with us. Wow, what a great tool!! Thank you to you and your daughter for sharing this with us!! This is great! My guild could have used the information when we were making kits for these quilts. Thanks for sharing this with us. I love that I know math specialists! Genius!!! Thank you so much for putting the calculator up for us! Doesn’t the length of the quilt have to be 16 or 32 times the finish width of the strips? If you are going to use 2.5″ strips, it will end up being 64″ long (32 x 2″). It will only be shorter or longer if you add or remove strips after you make this last turn. Can you add a calculation for how long the initial single strip sewn together should be so we can use our scraps, which are varying lengths? I usually work backwards to figure out how many inches I need in order to receive a certain width quilt. The constant is that it will be comprised of 16 or 32 rows. I have worked the numbers every way I could think of and I still can’t come out to 42.666. What do you divide by what? I used this calculator the other day, but now it is not showing up. Was it removed? I can’t get the calculator to work this time. Anyone else having a problem? I can’t seem to access the calculator. What am I doing wrong? I can’t seem to get the calculator to work. I have tried linking to it and all I get is a “picture” of the calculator. Nothing is interactive. What am I doing wrong? I think this would be just what I am looking for! I have friends who have made this quilt and it turns out too long and skinny for my tastes. To be able to figure it so it is 60″ x 80″ would be GREAT! I can’t get the calculator to work. I see I am not the only one. Am I doing something wrong or what? Can you please help me? This is amazing. I have been fiddling with pen and paper for days, trying to figure out the best way to make the quilt larger. And I could have done it here in 20 seconds. Thank you for sharing this great tool. I just wanted to take a moment to thank you for sharing your time and talent to gals like me who need gals like you! Thank you. Thank you so much for sharing this calculator and information! Thanks for sharing this calculator. I teach for JoAnns Fabrics and this would be so helpful. We just finished doing a Jelly Roll quilt. This would have been so helpful. Is there a way you could make it available as a app or something that we could put on phone and have it for class.? I can’t use your calculator no matter where I’ve pulled it up. So how do I get the right link. About to make my first strip quilt. I’m a beginner to sewing. This is frustrating. I just need to know how many jelly rolls I need to a queen to king quilt. Hi, Thank you for posting the calculator, but it didn’t work for me. The quilt came to an odd size instead of the measurements I plugged in. I used 2.5 inch strips and 1/4” seams. I just double checked using the calculator and I used the correct number and length of strips. Just thought I’d share–in case it helps others. Would you create a calculator to determine the size of a quilt, knowing the # and size of each strip that you have? For example, I have 34 strips – 2.5 inches each. What size quilt is created? Thanks. Thanks for the calculator, it came in handy to figure strips for a queen size bed. Actually, I like your method better for sewing the strips together. 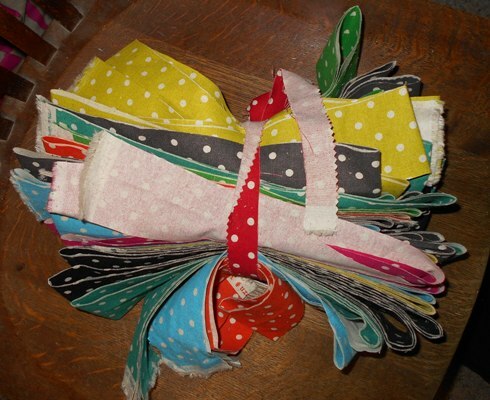 Being a perfectionist (not by choice, it’s a genetic trait), I can choose which strips to sew next to each other. Debbie White- I made a Queensize (90″x96″) jelly roll race quilt and used 109 strips. I divided the strips into 3 piles and sewed them into three sections that were 90″x32″. Then I sewed the three sections together to make the 90″x96″ quilt. I cut my own strips, but you can buy 3- 40 strip rolls and you will have a few extra. Sew each roll into a 90″x32″ section and then sew the sections together. maureen sloggie- My notes say that if you have 6 different fabrics (for example) you will need 1 1/3 yds of each fabric to make a 90″x96″ Queen size quilt. So that would be 8 yds total? Plus 3/4 to 1 yard for the binding. This was so helpful. Thanks so much. Your daughter is a genius. What a great idea! Thank you to your mathemagical daughter for making it available here. Was wondering if there was a different link to the calculator??? Is there a new link to the calculator? I must still be missing something because I can’t find the calculator.